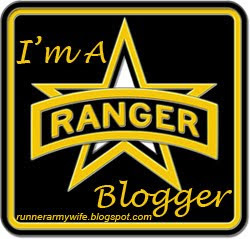 This post is super long and all about my experience with my husband going through Ranger School. This may be a bit rambling, but I want to get everything on the page. When Lane first left for Ranger School, I desperately looked around for any guides that would explain how everyone worked and what was happening. Some websites were SO helpful. I want to try to provide information for any other new mil-spouses who have questions, but also record all my memories so that I can keep a journal. This was the most commonly referred resource when you ask anyone about what happens each day at Ranger School. 1st Lt Martin had his letters from Ranger School added to his website. It basically gives you an idea what they are doing each day. It is a few years old, but I asked Lane and he said it did match up pretty well. One thing that is important. 1st Lt Thomas Martin was KIA October 7th, 2007. I know it was hard for a lot of women to identify their husbands with Lt. Martin's experience and then find out that he had passed away. I knew before I started reading the blog, so I didn't have that horrible shock. The day by days are the most detailed and accurate for the first two phases. Nothing was ever added for Florida, but it is very helpful for the first two. This is the Ranger Training Brigade website. This has the mailing addresses for all three phases. During each phase you will also have to add Company, Platoon, and Squad. I didn't have Lane's During the first phase, but mail still got to him. If you can get his roster number, I would definitely add that right after his rank and name on the first address line. Lane spent days getting everything ready before he left for first phase. I think we went through the packing list four or five time. The entire living room was covered in an explosion of camo. If you are missing even one thing off the required list, you can get sent home. I think I dropped Lane off on Sunday night even though the first day was technically until Monday. Camp Rogers is pretty easy to find. The student information link above has the map. This phase was both harder and easier than I thought it would be. 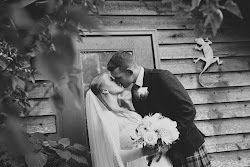 Our wedding was only a few weeks before he left, and saying goodbye after the wedding was harder than I thought it would be. Even though I was going to see him in less than three weeks, it was still rough. I have a goal of never crying when we say goodbye, so I was happy upbeat saying goodbye at Rogers. We got there about an hour early and talked in the parking lot. I hate the waiting. It is, of course ,good to arrive early for these sorts of things, but the waiting for him to leave is worse than the actual leaving. As I pulled out of the lot at Rogers, I told him to "have fun" and I would see him soon. I went back to Virginia to pack up my apartment get everything done for the move south. This definitely made the time go by faster. There is a whole scale of the times at which guys are most likely to be dropped from Ranger School. One of the most common is in the first few days, when they do all the physical fitness tests. I stayed in Columbus long enough to make sure Lane wasn't dropped that early. I dreaded hearing my phone ring. I knew that seeing an unknown 706 number could mean he was dropped. Luckily there was no phone call, and I started my trip back to Virginia. His 8-Hour pass was October 28th. The pass is for those who have successfully made it through the first phase of Ranger School and are going to the mountains. I was a nervous wreck all morning as I ran around Columbus trying to get everything ready. I had tons of food, and everything I thought he might want. I brought two dozen Krispy Kreme donuts with me to Rogers. The few that Lane and his friends didn't eat were quickly given away to strangers. I arrived about 45 minutes early, but still had a hard time finding parking. Tons of cabs come early knowing that the guys aren't allowed to drive. It was a really positive atmosphere, with everyone so excited to see their guys. Once the guys started coming through the gate, all of us moved closer to look for our loved ones. I saw Lane come through the gate, and couldn't believe how skinny he was. He didn't weigh himself, but I think he was thinner after the first phase than he was after the entire thing. His eight-hour pass went by so quickly. He had a ton of laundry. We also stopped by Commandos, Ranger Joe's and Extreme Outfitters. I think he destroyed two pairs of boots during the entirety of Ranger School. Taking him back to Camp Rogers was extremely stressful. Lane forgot to get a haircut, and our attempts to find clippers resulted in pulling into Rogers at about 7:57 for an 8:00 formation. My number one piece of advice for the eight hour pass is to get a hair cut first. I only got a few letters during first phase, but I sent them out pretty much every day. I heard repeatedly how much the letters help. I would try to send a variation of things. Some days it would just be a funny postcard. Other times I would write about what I had been up to. I know some people give full disclosure as to their lives in letters, but I didn't tell him anything bad or stressful. We had some problems with our apartment complex management, but I was able to resolve them without him. I didn't want him to worry about me or how I was doing. I always included how much I loved him and how proud I was. I also talked about Christmas and everything we would do when he got home. I think it helps to see past the misery of Ranger School toward happy things in the future. The second phase of Ranger School is located at Camp Merrill in the North Georgia mountains. Funnily enough, Camp Merrill is only about thirty minutes from the lake where we got married. Second phase went by fairly quickly. I started working in Columbus, and got settled in the apartment. Despite the cold, I think Lane really enjoyed being in the mountains and being able to eat more. They had mail call more regularly, and I got a lot more mail during the mountains. You can also send a care package which will be opened on the last day. Lane sent me a very detailed list of what food items he wanted. I send the package on Monday to make sure that it would be there by Friday. I got a tracking number to make sure it was there on time. . There isn't a pass at the end of mountain phase, but they can make a phone call. I knew to expect the phone call on Saturday November 19th. The day the phone call is supposed to come does not always pan out, but in this instance it did. I had to work all day Saturday, so I carried my phone around in my pocket and checked in incessantly. At about 4:00 I had a call from an unknown 770 number. I freaked out thinking it was him. It was a woman who had the wrong number! I have never been so annoyed about a wrong number in my life. He finally called at about 10:30 that night. It took him forever to say that he actually got his go, but he did! I was relieved that he was moving on to Florida. This phase honestly took the longest to pass by. 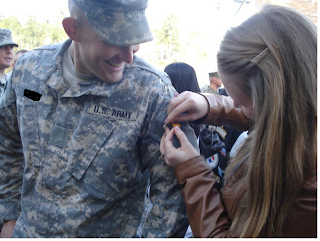 Graduation seemed so close, and I had renewed faith that he would make it through Ranger School in one go. Most guys have to recycle at least one phase, and Lane was extremely lucky to make it through without recycling. One thing about Florida is that they don't have regular mail call. The whole phase is basically two big FTX's. Lane said that he got all my letters in the last few days. I should have saved on postage and sent them all at once. I would also recommend sending another care package for the end of Florida. They have a lot of waiting around during the out processing phase, not to mention the bus ride back to Columbus. I sent him a few magazines and more snacks. I knew that I should expect a phone call around Monday December 4th. I didn't actually hear from him until the night of December 5th. This was a bit stressful, because we were waiting to hear before various family members started the drive south. Finally he did call, and was able to chat for a few minutes. He got his go in Florida too. I am so proud that he made it through Ranger School in one try. Graduation was Friday December 9th, but he got passes on the Wednesday and Thursday before that. I was at work when he was released on Wednesday. His mom picked him up and we met at a restaurant for dinner. I saw the car pull up, and just was so happy and relieved to see him in one piece. Country's BBQ was one of the places on his "must-eat" list. I found that food becomes more and more important as Ranger School goes on. His letters started focusing more on what he wanted to eat when he got home. The Ranger Graduation ceremony is a great event. It started around 10 with a Ranger demonstration. This was the RI's demonstrating all the skills that the guys supposedly learned in the last 62 days. Later Lane said they didn't real do anything like the demonstration, but it was highly entertaining. There are helicopters flying around, and things explode. It was really fun, and my family was really impressed. It wasn't too cold on Friday morning, but we still brought blankets to sit on. I would definitely suggest this, because the bleachers are just freezing cold metal. It was nice to have something to sit on. After the demonstration there was a speaker who was short and to the point. I have heard that most Ranger Graduation speakers know that everyone just wants to get to the tab-pining. When we were permitted down onto the grassy area we went straight to Lane. Everyone stood around while I pinned on his tab. I was so proud of him, and happy that the last two months were over. I kept all of his letters, and he held onto all of mine. They are now in a photo album so that I can look back on them later. I love keeping stuff like that. and i love looking through old letters. it's always so romantic. Thanks for your sweet comment. It went by much faster than I thought it would, and I am just glad he didn't get hurt. By the way, I loved your post today. Thanks for all of the useful info!! Lauren- I wanted to reply by e-mail, but I think you have your response set to noreply@blogger. I have always heard that people got phone calls, but but I did get mine quite late Saturday night. If the lines were really really long, maybe he couldn't get to the phone till today? If you have his information, I think you can call 6th RTB and they can tell you if he recycled. Good luck! 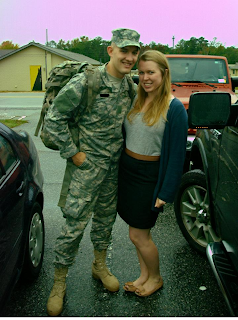 I just dropped my husband off at Ranger School yesterday. We both went in thinking there wouldn't be any communication at all so after reading your blog has lifted my spirits. Do you know where I'd find his class number for the mailing address? Born and raised in Georgia, I now live with my solider husband in Northern New York. Welcome to my little world. I write about my love of all things for the home, fashion, Doctor Who, and everything lovely.